You may also know that bisphosphonates, hormones and SERMs are common drug treatment options for people with osteoporosis, and calcium is an important supplement. But did you know there’s another medicine that can help preserve bone density, reduce your risk of fractures and allow you to enjoy the lifestyle you want? Here are five ways a kinesiologist can help you move better to live better with osteoporosis. A common myth is that if you weight train in your 50s, you can build bone density back up. That’s not the case. Research says you can potentially reduce the speed at which you are losing bone density, but past the age of 40, you can no longer replace bone tissue as quickly as you lose it (Source: International Osteoporosis Foundation). That’s why it’s important to protect the bone mass you do have. Kinesiologists are human movement specialists. They’ll work with you to build a customized exercise program designed to protect your bone mass. It will include weight-bearing exercises like walking, jogging, aerobics or dancing, along with strength training exercises. With a kin, you can manage pain and improve the strength of bones and muscles. A kinesiologist can show you how to modify these movements to reduce the risk of fracture. With a kin, you can continue to enjoy the sports and activities you love. Porous bones are at a higher risk of malformation. When women in their senior years develop a hunched posture, bone malformation and weak back muscles are often the cause. Lie on your back with your head and neck in a neutral position (head can be on a pillow). Engage your core and press your shoulders down to have them flat on the bed. Maintain your breathing. Hold for five- to ten-seconds, maintaining your breath, then relax. 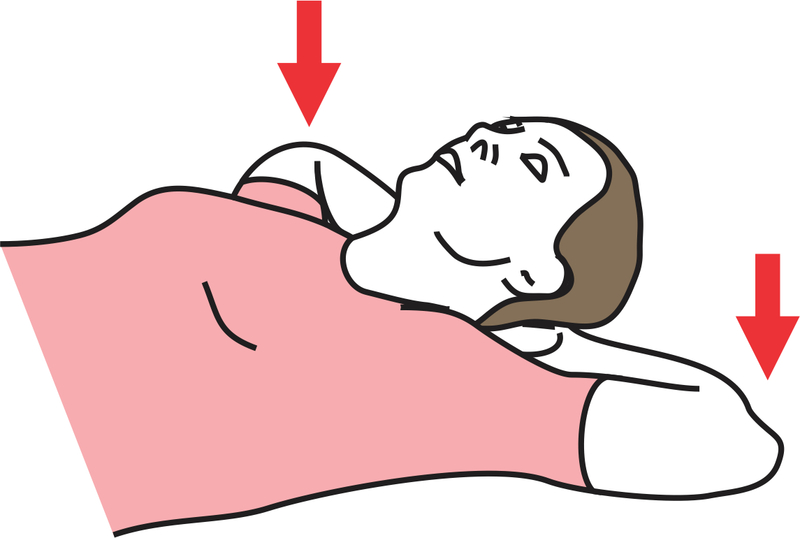 Lie on your back with your hands behind your head and your elbows out to the sides. Engage your core. Gently push your elbows downwards into the bed or floor as far as is comfortable. Hold for five- to ten-seconds, maintaining your breath, then relax. Lie on your back with knees bent. Nod your chin to neutral and maintain that position throughout the exercise, keeping the surface muscles relaxed. Hold the elastic in both hands, with both arms pointed straight up toward the ceiling. Engage the muscles at the bottom of the shoulder blades to hold the blades back and down throughout the exercise. Maintaining that position, hold one arm steady while you move the other arm out into short arc movements – straight out, then 2 diagonals progressively higher overhead and then back, while controlling both the shoulders and neck position. Repeat on the other side. Rest then repeat, always starting by setting both the neck and the blades. With a kin, you can move better while protecting your spine. Many people who have fallen and fractured a bone become fearful of walking independently, and they start to avoid it. Walking is one of the best ways to preserve bone mass because it is a weight-bearing exercise that puts just the right amount of strain on your bones – enough to strengthen them without risking a fracture to your hips, spine or wrists. Exercising in a chair, on a bike or in the pool just can’t match the benefit of walking. Standing with your feet slightly apart, back straight and arms on your sides. Shift your weight on your right and on your left, going the farthest that you can go without losing balance and keeping the foot on the ground. Stand straight with a steady object in front of you. Put only the tips of your fingers on the object only to keep your balance. Lift one knee toward your chest while keeping your balance. Return to the starting position and repeat with the other side. Hold onto the back of a steady chair. Lift your heels up so that you are standing on the front of your feet for a couple of seconds, then lower back your feet flat on the floor. With a kin, you can improve your balance and move with confidence. Osteoporosis is called the “silent thief” because it can progress without symptoms until a broken bone occurs. Simple movements, such as bending over to pick up a heavy bag of groceries or sneezing forcefully, can lead to broken bones in your back. Bending forward and rounding your back compresses (squeezes) the front part of each vertebrae in your spine. With a kin, you can learn how to protect these vertebrae by keeping your back straight during everyday movements. A kinesiologist can teach you how to use a squat or lunge-type movement to pick up items off the floor, unload the dishwasher or lift a heavy bag of groceries. When should you talk to a kinesiologist? They can determine whether you’re at a low, medium or high risk for fracture and build a movement program to help you preserve bone mass and avoid fractures. Medication is only part of the solution – make the move to improve your balance, strength and posture too. This blog is published as part of the 2018 National Kinesiology Week campaign in support of Osteoporosis Month and World Diabetes Day on November 14th, while increasing the visibility of kinesiology through organization of promotional activities in November. The Canadian Kinesiology Alliance (CKA / ACK) represents seven provincial kinesiology associations (APKs) and more than 3,800 affiliated kinesiologists and develops strategic partnerships with other national organizations and supporting initiatives for active lifestyle. Kinesiologists provide services to enhance human movement by providing quality solutions through prevention, objective evaluation and evidence-based interventions. The ACK / CKA establishes and promotes the standards of the profession across Canada.